Several years ago, I went to Tuscany for the first time. 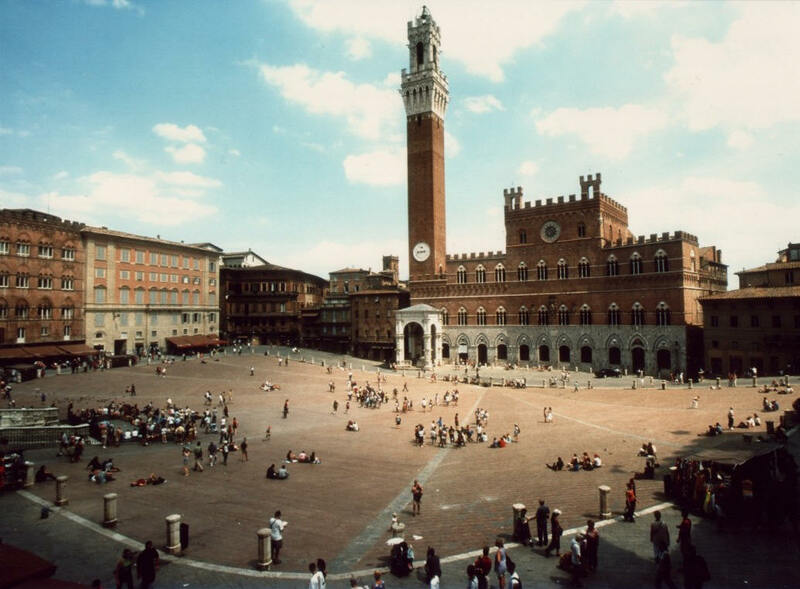 I'm lucky enough to work for a company with a major research and manufacturing center in Siena, Italy. It's actually the largest site in my division of the company. Which means, as much as I generally speaking hate the very idea of packing my suitcase, sleeping in not-my-bed and showering in not-my-shower, I still end up there at least a couple of times a year. In this case, at least, it's a burden I'm willing to shoulder. You know, for the good of the family. Because I'm all noble like that. Back to that very first trip. I was out with the team at a little restaurant tucked up a cobbled street behind the main piazza del campo (the one where the horse race happens. Think James Bond & 'Quantum of Solace'). My Italian is not so good, even these days, though I can pretty much work my way through a menu. On that first trip, I just asked my colleague next to me - a native of Siena - to order whatever she thought I'd like. 'Something local.' I said. She smiled, and promised to take care of me. What came out next was a selection of antipasti. Salumi. Bruschetta smeared with a kind of dark liver pâté meets haggis. And one particular plate of what looked like thin slices of fat, with a dusting of dark chocolate shavings. Normally I don't trouble myself too much with asking what is in a particular dish. I've found that I'm usually better off not knowing before I taste it. But my curiosity was piqued. "What's that?" I asked my colleague. Her eyes lit up as she told me. "Lardo di Colonnata. You must try it." Even with my rudimentary Italian, I was pretty sure I knew what she was talking about. I speared a slice with my fork, and put it onto a slim piece of toast - crostini and popped it into my mouth. Imagine a slice of salami for a moment. Perfectly cured. A little salty. Now remove all the needless meaty bits from that salami, and leave behind the creamy-yet-toothsome fatty bits. Now sprinkle that with a bit of Olympian ambrosia. and add a dash of crack cocaine. And it's still better than that. Silky, salty perfection. Each trip back, I always sought out the lardo. It's a Tuscan specialty, made for hundreds of years in the north of the region, and difficult to find (or even conceive of) outside of the region. The process involves taking fat from the back of a pig and curing it for about 6 months in a marble basin, stowed away in a warm cave in the hills, or maybe a dirt-floored cellar of a family home. At one point apparently someone official in the EU caught on to the process and was horrified. Because, you know... that just doesn't sound healthy. There was a brief movement to shut down production. The people of this tiny town, thankfully, fought this intervention successfully, proving that a) nothing unhealthy could live through that curing process, and b) the stuff just tastes too damn good to be banned. And so it continues to be made in the small village of Colonnata using traditional techniques. Ever since we started getting our own pigs a couple of years ago, I've had an idea in the back of my head to work up towards my own lardo. Ambitious, I know. But I've been working up to it. When I started to plan my latest trip to Italy for work, I told my Bride I'd be spending an extra day or so, to make a special trip up to Colonnata. I had the pig fat. I just needed the special basin. And to see the source, and meet the people that make it. 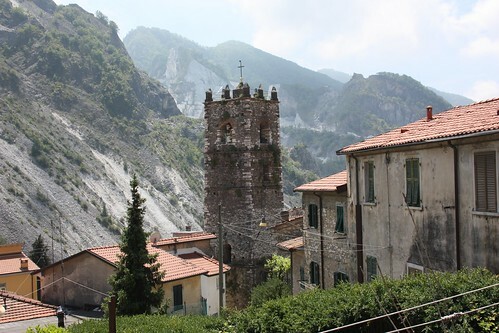 Colonnata is a small village - can't be more than a couple of hundred people. 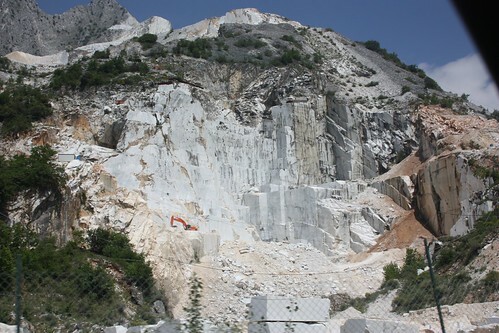 It is in the mountains above Carrera - as in, where the marble comes from. It's a long, windy road up, and you can see where the slopes have been cut away in huge quarries, leaving the hill sides in jagged, straight-cut edges of white stone. When you get near the village, you have to pull off and walk the final half kilometer or so up the hill. Looking at the quarries as I hiked up the road, it was easy to see why the men who cut and hauled the marble away appreciate the high-calorie practicality of a meal like lardo. 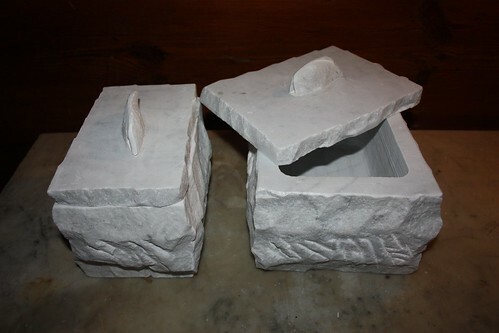 I wandered around the village for a bit and found a little shop near the edge that had all sorts of marble products. On the floor, several boxes were set out. More than boxes. They were basically hollowed out cubes of marble. I got excited. In my broken Italian, I asked the proprietress... "Concas? Por... um... lardo?" She smiled and nodded. I looked and lifted and poked, and couldn't decide. Then she showed me the prices. 30 to 50 euros apiece. Holy crap. Cheap. I bought 2 immediately. She wrapped them up for me, and pushed the bags to the edge of the counter. Then I remembered: marble? It's heavy. Each one of the basins weights over 10 kilos. And I still had to make it back down the hill to my car. Not to mention figure out a way to get them home in my suitcase. It didn't matter. I was so ecstatic to have them, that I could have bought another pair and still been happy stumbling down the hill. 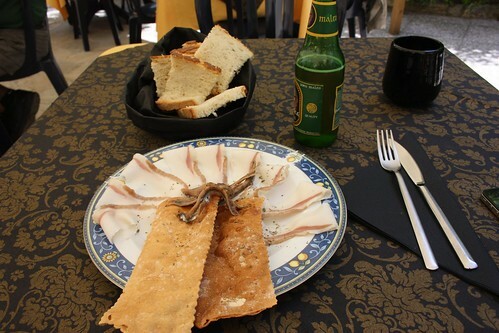 I sat outside at a little bistro, eating lardo and anchovies, sipping a beer, grinning like an idiot. Now I've just got to dig all the fatback out of my freezer, and start the curing process. I'll let you know how it turns out. Six months or so from now.